Is bacon your jam? Then you’ll love these savory pastries stuffed with our sweet and smoky bacon-based relish. Made with thick smoked bacon, garlic, coffee, bourbon and chipotle chilies, this oh-so-sinfully-delicious bacon jam is baked inside puff pastry pockets topped with cheese. 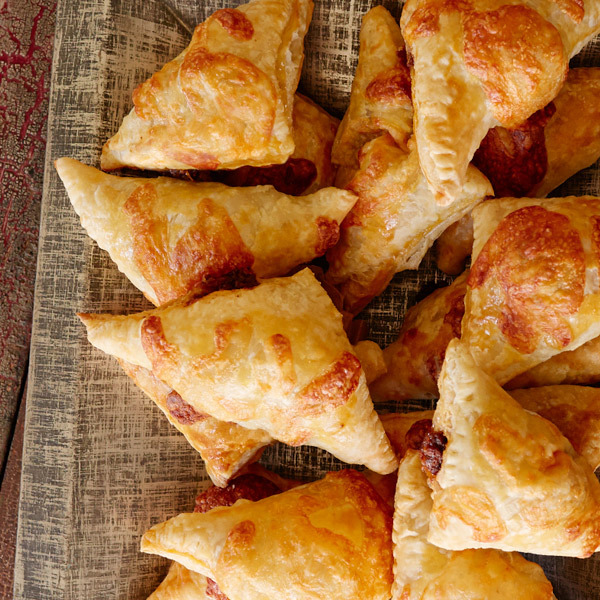 When you flag them with our free printables, these easy Bacon Jam Turnovers are sure to become your new game-day grub MVP. Cook the bacon in a large saucepan over medium heat until the fat has rendered and the bacon starts to get crispy. Remove bacon and set aside. Reserve 1 tablespoon of the grease in the pan. Add the onions to the pan and sauté until tender, about 5 to 7 minutes. Add the garlic and sauté until fragrant, about a minute. Add the vinegar and deglaze the pan. Add the bacon, coffee, brown sugar, maple syrup, bourbon, chipotle chilies, cumin and pepper to the pan. Reduce the heat and simmer until reduced to a syrupy consistency, about 1 to 2 hours. Pulse the mixture in a food processor until the mixture is a bit smoother (not too much or you will lose the texture of the bacon). Set aside. Lay out half of the puff pastry sheets on a lightly floured surface. Cut into 8 squares. Place 1 tablespoon of bacon jam on each square. Brush edges with egg wash and fold over to form a triangle. Gently press edges of triangle with a fork to seal. Repeat with remaining squares. Move turnovers to a baking sheet. Brush tops with more egg wash and sprinkle about half of the shredded cheddar cheese over the turnovers. Bake for 12 to 15 minutes or until turnovers are golden brown. While turnovers are baking, repeat process with remaining puff pastry and bacon jam to make 8 more turnovers. Allow turnovers to cool slightly before serving.